In the latest episode of Pursue The Wild, Tips From The Wild, I explain why I love Wilderness Athlete Energy & Focus- from the simplest reason that in the back country we often don't have the time to boil water for coffee to the adaptogenic herbs that help your body combat stress and neuroactive compounds that are going to help your entire body feel and perform optimally. Check it out! In the latest episode of Pursue The Wild, Tips From The Wild, Kristy Titus explains why she loves Wilderness Athlete Energy & Focus- from the simplest reason that in the back country we often don't have the time to boil water for coffee to the adaptogenic herbs that help your body combat stress and neuroactive compounds that are going to help your entire body feel and perform optimally. Check it out! Caveman Strong- Organic Living For Better Health. Having an an appreciation and connection with nature is the soul of the hunter and a lifestyle that I have been preaching for over 7 years to Western Hunter Magazine subscribers. In the latest Nov/Dec issue I write about a Paleo-ish lifestyle. 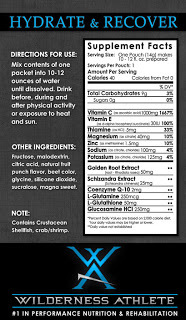 The Do’s and Don’ts along with the details of the NEW Wilderness Athlete Paleo-ish Supplements. Check it out and if you’d like to try the new WA Paleo-ish Beef Protein Powders and Hydrate & Recover head over to my website at www.kristytitus.com and click the Shop tab. This is not your grandmothers stuffed pepper recipe. The recipe can be found in the Wilderness Athlete Wild Kitchen Cookbook and has been brought to life in this delicious all-natural recipe prepared by Kristy Titus. The exciting twist in this recipe features sweet potato instead of traditional rice and topping the entire dish off with feta cheese sprinkles makes it amazing. Healthy cooking the entire family will enjoy. Preheat the oven to 350 degrees. Heat the oil in a large skillet over medium heat. Add the garlic and stir constantly for 1 minute. Then add the ground wild game meat (elk) and cook until it is no longer pink. Add the onions and sweet potato. Cover the skillet and let it cook until the potatoes are tender while stirring occasionally. If you need more steam to soften the potatoes, add a little bit of water. Next, add the tomatoes and spices. Simmer for 5 minutes. Slice the bell peppers in half lengthwise and remove the seeds. Place them open side up in a large baking dish. Fill each half with the meat and potato mixture. Bake uncovered for 30 minutes or until the peppers are soft. Top each half with 1/2 TBSP of feta cheese. Serve and enjoy! *In the video example the recipe was doubled. Bend, Oregon– Kristy Titus, certified nutritionist and fitness competitor, is joining forces with Wilderness Athlete for a 28-day fitness journey and sweepstakes that includes giving away prizes and discounts to encourage participation. Use code TITUS at checkout at Wilderness Athlete's website and receive 10 percent off any order. Plus, get a chance to win $200 in product Wilderness Athlete and prizes from Girls with Guns Clothing by connecting with Titus on social media using the hashtag #TITUS28DAYS. "Staying fit in hunting's off-season is a trial for me, so I approached Wilderness Athlete to start a group fitness challenge using their 28-day starter pack," said Titus. "Together, we can support one another in this journey to a healthy lifestyle. Follow me on social media where I will share tips for clean eating, exercise and more." Share your health fitness journey on Instagram, Twitter or Facebook using the hashtag #TITUS28DAYS and you will be entered into the sweepstakes. Three winners drawn by April 30, 2016 will receive $200 in Wilderness Athlete product; the Grand Prize winner will also receive a hat and pair of running pants from Girls with Guns. 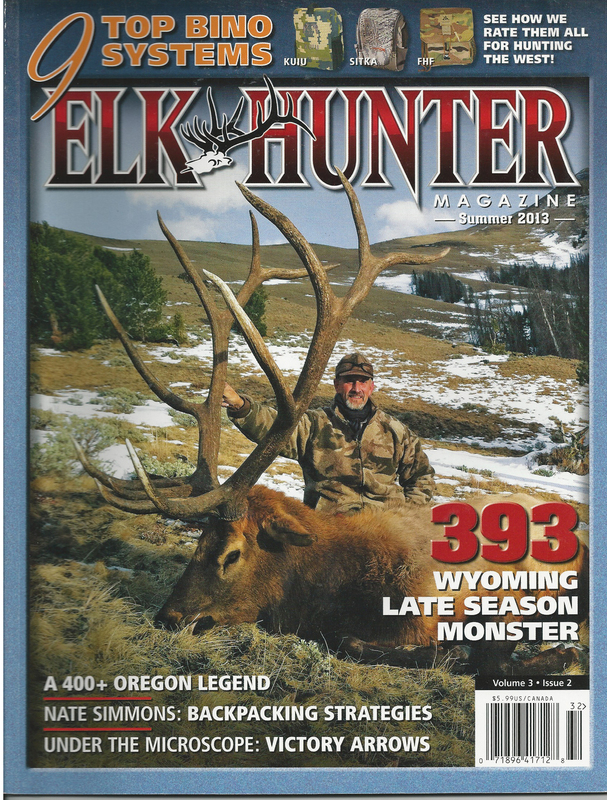 In the Summer issue of Elk Hunter Magazine, in Kristy's article titled "Does Sugar & Spice Make Everything Nice?" she discusses how to navigate sugar at home and on the mountain giving the basics on label reading and how to reduce sugar. In the Spring issue of Elk Hunter Magazine in Kristy's article titled "Wired for Struggle" she discusses the fact that in order to be fit, lean and healthy one must be willing to struggle and what that means exactly. In the Winter issue of Elk Hunter Magazine in Kristy's article titled "Do It All" she discusses making the most of yourself in your attitude, avoiding stress, getting enough sleep, exercising, eating right and taking vitamins. In the Fall issue of Elk Hunter Magazine, Kristy's article titled "Meals for an Extended Hunt" she discusses quick, easy, lightweight meal options for backpack hunts. In the summer issue of Elk Hunter Magazine, Kristy's article "Hydration & Sports Drinks" she discusses how to stay hydrated on your next hunt or in the gym. Plus gives the low down on the good, the bad and the ugly about sports drinks. 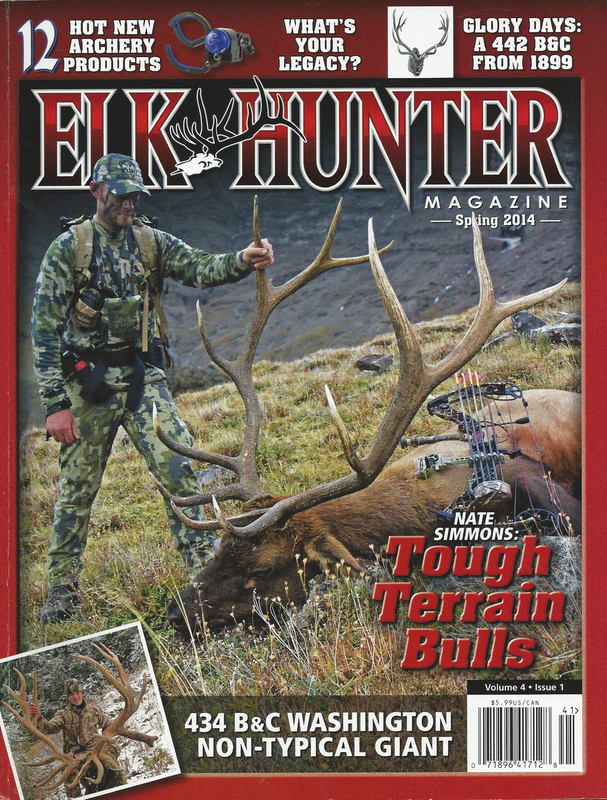 In the Spring issue of Elk Hunter Magazine Kristy's article titled "Winning the Fight Against Fatigue" Kristy discusses the importance of consuming adequate amounts of clean, lean, hormone free wild game meat. In the Summer issue of Western Hunter Magazine Kristy's article titled "The Paleo Lifestyle" Kristy discusses exactly what is the Paleo diet, her experience with the diet and suggestions on where to start eating a diet based on the paleo lifestyle. Every issue features helpful gear reviews, tactics, information and more from our experienced team of editors including: Ryan Hatfield, Nate Simmons, Mike Duplan, Roy Grace, Bryan Martin, Chris Denham, Kristy Titus, Tony Bynum, Andrew Chamberlain and Remi Warren. In the Spring issue of Western Hunter Magazine, Kristy's article titled "Sodium Intake on an Extended Hunt" Kristy discusses how much sodium you really need to consume and even makes some low sodium meal alternatives. Climbing mountains in the most severe conditions, pushing your mind and body to the limit on a daily basis, hunting season is almost here. The only true test of our individual performance level and overall toughness comes courtesy of Mother Nature. When pushing your limits this hunting season in the backcountry, your body can lose as much as 4% of your entire body weight in the form of sweat potentially causing severe dehydration and hyperthermia. Proper hydration is critical before, during and after your next trip into the backcountry in maintaining normal hydration levels, circulation and natural cooling of the body. As the body sweats, your blood becomes less fluid due to water loss, subsequently causing the blood to become thicker, therefore increasing the workload of the heart, which could potentially result in a heart attack. Proper hydration is critical in the prevention of dehydration, hyperthermia and even heart attack. Outside Temperature- The higher the outside temperatures are the more your body is going to sweat, the body’s natural cooling mechanism causing higher levels of water loss within the body that needs constant replenishment. Hydration Level- If you enter the field in an already dehydrated state, you are in the great danger of suffering from severe dehydration or hyperthermia. Before your next trip into the field drink a minimum of 96 ounces or three quarts of water per inactive day and during days of high activity, double that amount or an equivalent of 192 ounces or six quarts of water per day. In the morning before you take your first steps in the morning, be sure to consume an additional 2-3 cups of water to boost your hydration level. Relative Humidity- When the air is saturated with moisture, the body loses its ability to naturally cool itself off by evaporating sweat efficiently therefore causing the body’s internal temperatures to potentially reach dangerous levels causing hyperthermia. Water intake is critical in humid environments. If you are thirsty, your body is already in a state of dehydration. Thirst can be mistaken for hunger. Mild to moderate dehydration can cause sugar and food cravings, especially in the evening, so before you pick up a snack, drink a large glass of water. 80% of people suffering from dehydration have increased back & joint pain. Dehydration can cause daytime fatigue, decreased motor skills, concentration and memory retention. Dehydration can be attributed to an increased risk of colon, breast & bladder cancer. By adding Wilderness Athlete Hydrate & Recover to your infield hydration system, you are not only replenishing fluid loss but also necessary electrolytes. Wilderness Athlete Hydrate & Recover provides an excellent source of electrolytes, vitamins, minerals, amino acids, and metabolic cofactors that power their way into the cells of the body. 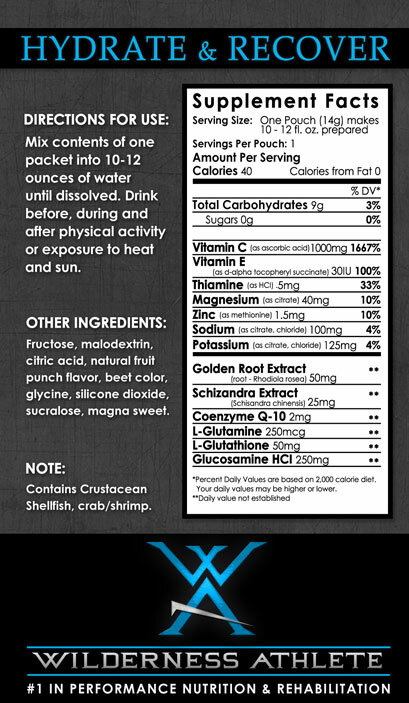 • Amino Acids to help feed your muscles through cellular repair. • Glucosamine for repair and lubrication of hips and joints. What energizes your mind and body day in and day out? Whether you are climbing the steepest mountains in the roughest, toughest terrain in the world, pushing through the last mile of your run, finishing your last set in the gym, or finding the energy to cook dinner for your family; your body needs fuel for the extreme. Optimizing your health, fitness and performance starts with the fuel you provide your body; there is nothing more powerful than optimal nutrition and hard training. I have prepared some general guidelines and tips to help you achieve higher energy and performance levels from the fuel you feed your body. Drink 3-6 Liters (96-192 Ounces) of water per day. Eat within an hour of waking, then every 3 1/2 - 4 hours after, up until 2 hours before bed. Eat two (2) meals with fresh fruit and two (2) meals with vegetables every day. Do not have more than a third of your meals per day as a meal substitute (protein shakes, meal replacement shakes, bars). Use shakes and bars only as needed for convenience in order to maintain the eating pattern of a meal every 3 1/2 - 4 hours. Jim Brennan enjoying a Wilderness Athlete Performance bar. There are three nutrients that directly provide the fuel our bodies require to function. These fuel sources are Protein, Carbohydrates and Fat. Below I am going to break down these three fuel sources into three classifications; Class 1 foods are the least refined and processed, whereas Class 3 foods are highly refined and typically contain large amounts of food chemicals and additives. Class 2 foods fall in between these two groups. Try eating most of the food (fuel) you consume out of the Class 1 group, a few foods out of the Class 2 group, and try to avoid eating out of the Class 3 group as much as possible. Use your free food list as needed, but pay attention to the free foods that have a limit of 2 per day. Fuel your body for the extreme; by training hard and eating whole natural food, you will increase your performance, health, accelerate weight loss & muscle gain, and increase your endurance.